This all started back in 2004, in Austin, Texas. Despite the location, I am talking about Intel and not AMD. In 2004, Intel's Austin Design Center was hard at work on another member of the Pentium 4 processor family - codenamed Tejas. Tejas was scheduled to arrive after Prescott and continue the NetBurst lineage, but as history would have it, Tejas never saw the light of day. The project was canceled and Intel's corporate attention was instead shifted to taking the Pentium M architecture and improving it to be desktop-worthy. The Tejas team was, as you'd expect, not particularly pleased with their project being canceled. But, as seems to be the case with Intel's best engineers and canceled projects, they channeled their disappointment into passion and excitement for their next design. I should stop the story here and point out the striking similarity to another Intel success story, that of the original Centrino. Banias was the first Centrino processor, later named the Pentium M. The team that worked on Banias was the same team that worked on Timna, yet another project cancelled very late in the process. After Timna was cancelled the team, working out of Intel's Israel Design Center, went into a brief collective depression for about a month before receiving instructions to work on Banias. Instead of producing something mediocre, the team felt a need to prove something to those who cancelled their beloved Timna project. The result was Banias, which became the Pentium M, led to the Core Duo and eventually gave us the Core 2 family of processors that we love so dearly today. Back to Austin. We've got a very small team of people who were hard at work on Tejas and now without anything to do. The same sense of proving their worth brew and in 2004 the team received new orders. 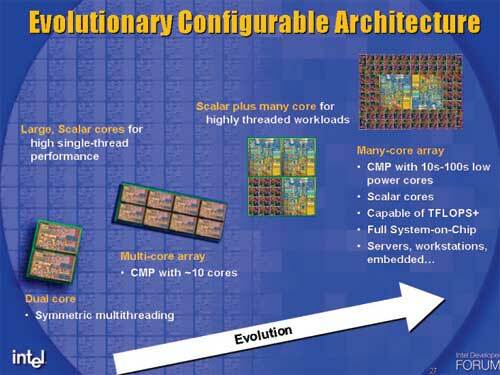 The task was to develop a low power, IA (Intel Architecture, read: x86) core for use in a many-core CPU design. Since this core would be used in a many-core CPU, it would have to be very, very low power (you can't have 10s of cores each consuming 100W). I asked the design team in Austin if this was a dirty joke played on them by upper management - going from a very power hungry design like Tejas to something that would consume a couple of watts. Apparently during Tejas' design, a smaller team in Austin was doing some pathfinding work, looking at very low power simple cores. Since they spent about a year doing this pathfinding work, the transition from Tejas to something very low power was natural despite what it may seem from the outside. Many of the architects that would work on this new, low power core actually came from other microprocessor companies. Belli Kuttanna, the chief architect on the core, worked for Sun on SPARC processors as well as Motorola designing elements of PowerPC cores. Belli worked with others from Sun and Motorola, but now all under the Intel umbrella. One of the members of the validation team working on the core was also a former AMDer. Early 2004 was the inception of the pathfinding effort to investigate what would be necessary to develop this new low power core. The codename for this core was Bonnell, which as I've mentioned before is the tallest mountain in Austin, measuring only 750 ft. The petite mountain was a perfect fit for this new, small core (engineers aren't the most creative with naming ;)). The first step in the pathfinding effort was to find out if Bonnell could be based on an existing Intel microarchitecture. The small team looked at reusing the Pentium M or the yet-to-be-released Core 2 and some analysis was done on both of these options. It didn't take long to come to the conclusion that it wasn't possible to hit the power and performance targets using an existing design. As Intel discovered with Centrino, in order to target a new market it would need to use a new microprocessor design. The team went back to a clean sheet of paper and started with the simplest of microprocessor architectures, a single-issue, in-order core and built up from there. The designers kept iterating until the performance and power targets at that time were met. You have to keep in mind that in 2004, even Intel didn't have a good idea of exactly where this core would be used. Imagine going back to 2004 and being expected to design the microprocessor architecture that could eventually be used in something like a third generation iPhone - it's borderline impossible. By the end of 2004, Paul Otellini gave the Austin team specific direction that the Bonnell core would be used in a standalone CPU - not as a part of a many-core design effort. This CPU would be used in UMPCs (Ultra Mobile PCs) and an even more unheard of creation called a MID (Mobile Internet Device). The many-core designs are still under development and I suspect that the first one we'll see come to fruition is a little gem called Larrabee. Bonnell was just a core, but when combined with a L2 cache and an external bus interface it became the CPU known internally as Silverthorne. More recently, Intel gave Silverthorne a proper name and called it the Atom processor. For price, you show the combined price for CPU + Chipset. For power, you say just the CPU... so 0.65W for the CPU... but you're conveniently ignoring the >2W figure for the chipset!!! This absolutely flatters Intel wherever possible. I still have a PowerVR 4MB addon card, runnung in tandem with a Rage128Pro. Quite a combination w. 15 FPS in Tombraider. Constant(!) 15FPS, that is.. The Atom represents a shift in processor architecture that is the most dramatic departure for Intel since introduction of x86 processors... the philosophy of how computing itself occurs from centralized processors to distributed processing based on an extension of the popular x86 instruction set. The Atom is not about the immediate prospects for the Atom or Nehalem products: we will likely see members of Intel's new product family be used in embedded applications in consumer products and in areas where specialized communications processors are more the rule. While not optimized for use in specific networking applications, the products capitalize on the wide range of support available in IT/Networking to develop common functions that leverage the low cost, low power/processing capability to be used as a common denominator for a wide range of applications. Intel has been built on the 'Wintel' architecture: massively integrated chips needed to handle the massively integrated operating systems and applications of Windows (and Apple) environments. The Atom allows migration and broadening out from that architectural motif to a very highly distributed architecture. So, the increased parallelism found in the internal chip architecture is enabling of changes in external system architectures and device applications that go well beyond the typical domain of Intel.. and right into the domain of 'personal wireless broadband' and SDWN, Smart Distributed Wireless broadband Network. Thanks to all the flash player ads, etc., a mobile web device will continuously avoid switching to low power states. Thus one could argue that advertising will be carbon footprint enemy of the internet's future. This is already becoming the case for desktop/laptop machines. Without such continuous (arguably wasted) consumption of CPU power, then Intel's engineered power management might have a significant impact on the value of the Atom. I am definatly much impressed and enthused by intels work here, the future looks interesting esp for those of us who like low power cross compatible computing products. However I have to point out that a low power modern x86 cpu has allready been done infact 4 years ago with AMD's Geode. While technically much weaker than the Atom and with out any where near the scalability (single core design etc.) the Geode has been available in the same TDP ranges for a good long while. Take a look here http://www.amdboard.com/geode.html">http://www.amdboard.com/geode.html for some old stuff.